Matching an Office 365 Azure Cloud user Identity with an On-premise Active Directory User Object. | Chinny Chukwudozie, Cloud Solutions. ← Removing a Temporary Template from System Center Virtual Machine Manager 2012 R2 using PowerShell. a) Microsoft Azure Active Directory Sync Services .Allows you to onboard to Azure Active Directory and Office 365.
b) IdFix DirSync Error Remediation Tool. This tool is used to perform discovery and remediation of identity objects and their attributes in an on-premises Active Directory environment in preparation for migration to Office 365. IdFix is intended for the Active Directory administrators responsible for DirSync with the Office 365 service. c) Microsoft Online Services Sign-In Assistant for IT Professionals RTW. This tool provides end user sign-in capabilities to Microsoft Online Services, such as Office 365.
d) Azure Active Directory Module for Windows PowerShell (64-bit version). As of this post, the 32 bit version of this tool has been discontinued by Microsoft. The error is a result of having a duplicate cloud and on premise AD object with matching attributes. To resolve the problem, I had to set the duplicate cloud identity with an immutableID value that matches the ObjectGuid of the on premise user object. The immutableID value can be retrieved by converting the Objectguid value of the matching on premise Active Directory user object. 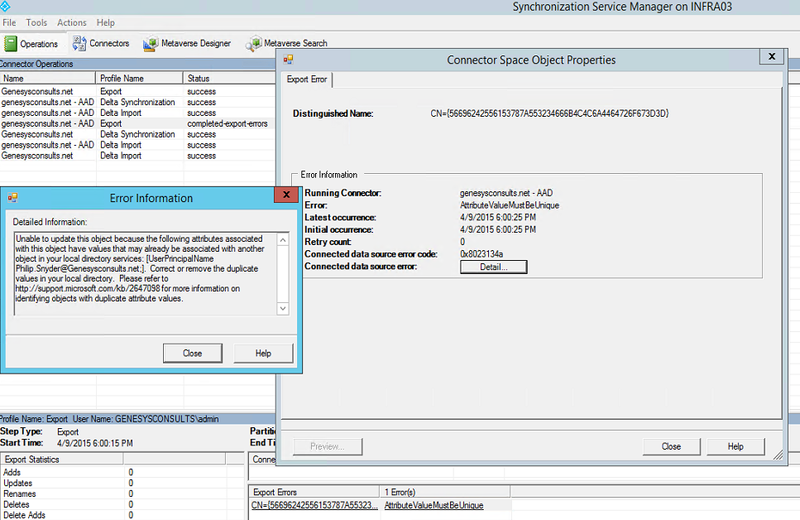 6) Verify the cloud identity to make sure the status of the user has changed to “Synced with Active Directory” . Usually, cloud identities that do not have an immutable id value are not synchronized with the on premise Active Directory. This entry was posted in Azure Windows PowerShell, Office 365 and tagged Azure AD Windows PowerShell, Azure ADSync, ImmutableID, ObjectGUID, Office 365, PowerShell. Bookmark the permalink. 4 Responses to Matching an Office 365 Azure Cloud user Identity with an On-premise Active Directory User Object. I checked it out. Good stuff. Hi, with new AD Connect version now it use mS-DS-ConsistencyGuid instead of objectGUID so how can we get ImmutableID?